O n their first anniversary as a couple in 2011, Haley and Simone Jude were hiking in grassy hills above a Northern California hot spring, discussing their future, when they had a vision — they should go into business together. They were in love and had similar passions. As a child of documentary filmmakers, Haley grew up surrounded by filmmaking and had a background in oral history. Simone was a videographer, who had been working on a feature film on the side. It almost seemed logical that they’d start a film company together. As it turns out, when you’re living and working with your significant other and you both describe yourselves as “stubborn, strong-willed, passionate people,” there’s a lot to figure out. 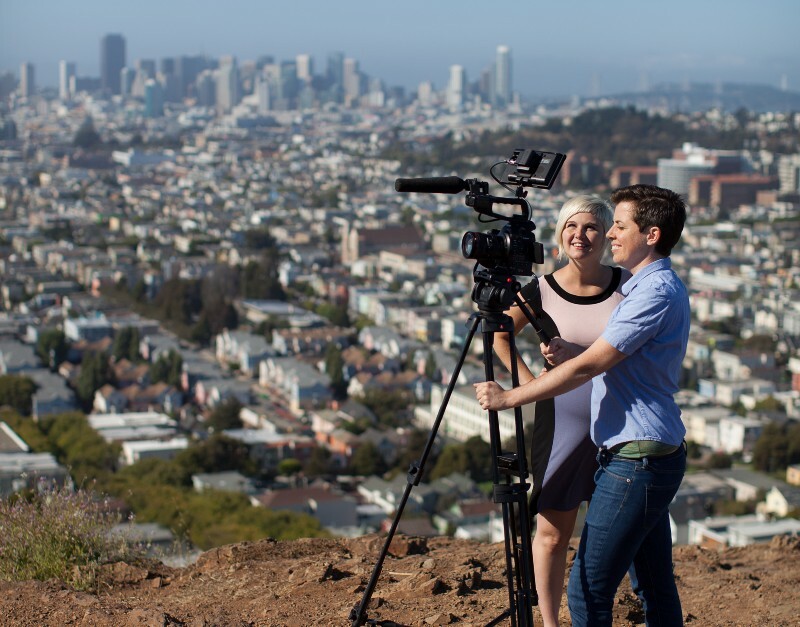 The following year, they quit their jobs and founded Moving Portraits, which specializes in documentaries and web video for companies and nonprofits. “Like how not to kill each other,” says Haley. Yet four years later, the Judes’ business and relationship is thriving. They are married, and last year became parents to a baby girl. This is the story of how they’ve made it work. The Judes run a boutique film company called Moving Portraits. Haley and Simone made their first mistake almost immediately when they set up their desks next to each other in their living room. Being in such close proximity turned out to be an invitation to distraction. “It was horrible,” recalls Simone. The couple put a stop to this by moving Simone’s desk into the spare bedroom and by using an “Open/Closed” sign to remind each other not bother the other when the sign said “Closed” unless it was an emergency. Another early problem was what they call “twinning,” or working on the same thing at the same time. “It’s the kiss of death for a small business,” says Simone. They wasted a lot of time this way in the early days, arguing over silly things like whether an edit should be moved up a few frames earlier. They found the solution in a partnership workshop where they learned about the importance of “spheres of influence.” Now they can offer each other their opinions, but one person has the final decision over whatever is in their “sphere.” For Haley, it’s client management, marketing, sales, production and content. Simone gets the final say in editing, post-production, directing and everything that is visual storytelling. The couple employs the same system at home where Haley orders the groceries, does the meal planning, trip and activity scheduling, cooking, and laundry, and Simone does all the cleaning. 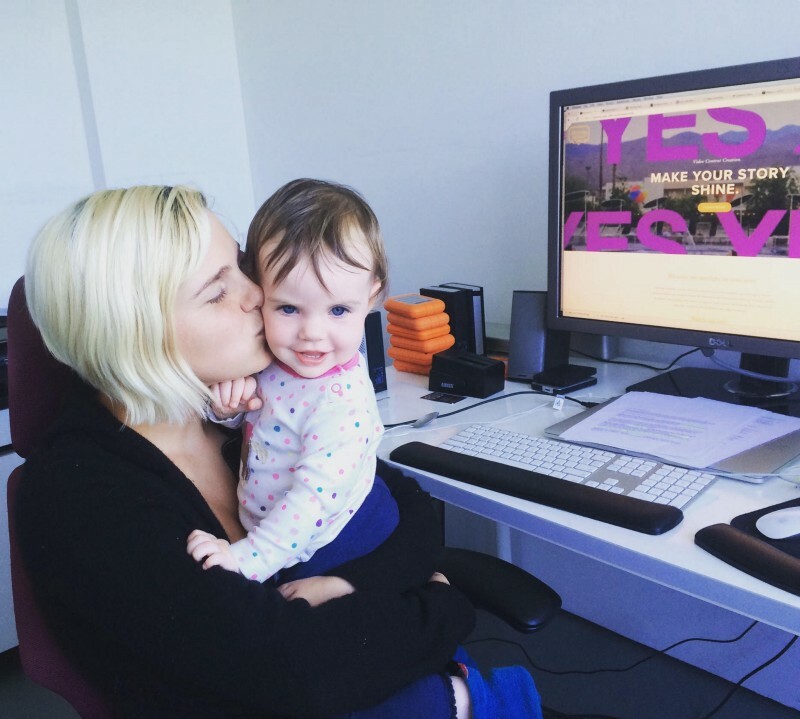 Haley Jude and her daughter Juniper, in the Moving Portraits office in San Francisco, California. As the Judes celebrated professional milestones over the years, like landing large projects, they have also celebrated personal ones. The got married in 2013, and their daughter Juniper was born last August. Juniper’s arrival brought a whole new level of joy and logistics to their relationship. “We had no idea what it would be like to run a business and have a kid,” says Haley. These days they take turns working and taking care of the baby. Haley does the early shift, working at the office they rent from 7am to around noon, while Simone hangs out with Juniper. Then they switch and Simone works until about 5 pm, while Haley watches the baby. When it comes to advice for others who work with their spouses, the Judes have a few suggestions. The first is to start a daily gratitude practice during which you take turns sharing three things you’re grateful the other person did that day. “From the very beginning, we were always 100% certain that we wanted our relationship to work and if the business was making our relationship worse, then obviously that would have to go,” says Haley. “Usually when you say three things you start thinking of a bunch of other things and it changes the whole dynamic,” says Simone. They also recommend a good partnership coach to guide you through the inevitable bumpy patches. And above all, before you decide to go into business with your romantic partner, they say it’s crucial to be really clear about which relationship is more important — the business one or the personal one. Now, they can’t imagine running their business alone. Emily Brady just ordered an “Open/Closed” sign for her home office.